June 30th, following the Feast of Saints Peter and Paul, we celebrate the early Christian martyrs put to death by Nero after the disastrous fire that burned down much of the city July 19, 64 AD. If I were in Rome today I would go to the church of Saint Peter in Chains or to the gardens of Saints John and Paul on the Celian Hiill to remember them. The two apostles were put to death around this time and many (we don’t know how many) followed them. There’s a blog and a video on the church of St. Peter in Chains here and here.And a video on the Stations of the Cross in the gardens of Saints John and Paul here. There’s also a video on the Quo Vadis story here. The persecution and martyrdom in 64 throws light on the creation of the Gospel of Mark, which many think was written in Rome afterwards. One thing I think this feast and the Gospel of Mark suggests: the Church of Rome did not flee from the uncertainty and persecution it faced then. I think the Quo Vadis story indicates that. It didn’t give up. with the blood of its first martyrs. and rejoice in their triumph. We ask this through our Lord, Jesus Christ, your Son. This entry was posted in Passionists, Religion and tagged Catholic Church, first martyrs, Nero, Rome, Saints John and Paul, St. Peter in chains, Stations of the Cross, the Gospel of Mark on June 30, 2011 by vhoagland. Good idea, nice and simple. Begun on the Feast of the two apostles who are considered the founders of the church of Rome it’s a website addressed to the world. And on its opening page there’s the pope playing with what’s surely an iPad. May others do likewise. I’m not quite sure about Peter, but I’m sure Paul would have loved one of those things. One story on the new site is about a new discovery archeologists made of a 6th century portrait of St. Paul, the Apostle, from a catacomb near Naples. Paul, is described in the story as looking like a Roman philosopher. He peers out from the side of an arcosolium, a burial place, at the mourners who come to honor their dead. He who saw the Risen Christ carries news of new life. “Quite rightly, too, did the Lord after his resurrection entrust his sheep to Peter to be fed. It is not, you see, that he alone among the disciples was fit to feed the Lord’s sheep; but when Christ speaks to one, unity is being commended to us. And he first speaks to Peter, because Peter is the first among the apostles. This entry was posted in Passionists, Religion and tagged Benedict XVI, catacombs, Passionists, Peter and Paul, Rome on June 29, 2011 by vhoagland. I was surprised to see Harold Camping at his usual place on television the other night. The rapture didn’t happen May 21st, he explained, because God wanted to alert the world that the end was going to come this October. A caller wondered if we could do anything about helping this world of ours, but Harold was quite firm that God was going to destroy it completely. It’s an open sewer, according to him. Nothing’s worth saving. How different from the Christian vision of St. Irenaeus, the 3rd century bishop of Lyons, whose feast we celebrate June 28th. He condemned the gnostics– favorites of new age thinkers today– for their dismissal of creation as evil. The One God is the source of our created world and we know him through it, Irenaeus taught. We cannot know God if we depreciate or ignore the world God has made; it mirrors his glory. The Word of God has a twofold role, according to Irenaeus, revealing God in creation and finally coming in the flesh to complete this revelation in Jesus Christ. No one has ever seen God, except the only-begotten Son, who is in the bosom of the Father; he has revealed him. “He revealed God to us and presented us to God. He safeguarded the invisibility of the Father to prevent us from treating God with contempt and to set before us a constant goal toward which to make progress. On the other hand, he revealed God to us and made him visible in many ways to prevent us from being totally separated from God and so cease to be. Harold should read that wonderful story from the Book of Genesis we read yesterday at Mass about Abraham bargaining with God for the salvation of Sodom and Gomorrah. The world’s worth saving. This entry was posted in Passionists, Religion and tagged Abraham, creation, glory of God, Harold Camping, Jesus Christ, Sodom, St. Irenaeus, the plan of God on June 28, 2011 by vhoagland. Last Saturday I celebrated Mass in a parish whose pastor was retiring and a new one was coming in to take over. It was the Feast of Corpus Christi, a vivid reminder of the presence of Jesus Christ among us. He is our shepherd and we are his flock. We’re very conscious today of human leaders, whether they are politicians, business leaders, bishops or pastors. We want them to keep things going, to solve problems and to lead us into the future. When things go wrong, they’re the first we blame. Often they are all we see. ” In this song we have declared that we are his flock, the people of his pasture, and the sheep of his hands… You are my sheep, he says. Even in the midst of this life of tears and tribulations, what happiness, what great joy it is to realise that we are God’s flock! To him were spoken the words: You are the shepherd of Israel. Of him it was said: The guardian of Israel will not slumber, nor will he sleep. He keeps watch over us when we are awake; he keeps watch over us when we sleep. A flock belonging to a man feels secure in the care of its human shepherd; how much safer should we feel when our shepherd is God. Not only does he lead us to pasture, but he even created us.”The words we have sung contain our declaration that we are God’s flock: For he is the Lord our God who made us. He is our God, and we are the people of his pasture and the sheep of his hands. Human shepherds did not make the sheep they own; they did not create the sheep they pasture. Our Lord God, however, because he is God and Creator, made for himself the sheep which he has and pastures. No one else created the sheep he pastures, nor does anyone else pasture the sheep he created. “The Lord is my shepherd,” we say. And he shepherds the world as well. This entry was posted in Passionists, Religion and tagged Church, Jesus Christ, leaders, Passionists, shepherds on June 27, 2011 by vhoagland. He begins by saying that “It does not say that it is blessed to know something about the Lord God, but that it is blessed to have God within oneself. Blessed are the pure in heart, for they shall see God. “I do not think that this is simply intended to promise a direct vision of God if one purifies one’s soul. On the other hand, perhaps the magnificence of this saying is hinting at the same thing that is said more clearly elsewhere: The kingdom of God is within you. That is, we are to understand that by purging our souls of every illusion and every disordered affection, we will see our own beauty as an image of the divine nature. We are sharers in the divine nature. We’re not God, who is transcendent, inaccessible, beyond our minds and knowing, but we can “see” God in ourselves, our own image, as we are purified from our illusions, our sins, our disordered love. Like many early eastern theologians, Gregory appreciates the basic goodness of human nature restored by the grace of the Redeeming Christ. No demeaning of humanity here. Going a step further, can the saint’s words apply also to creation itself? If our created world as well as our human world mirrors God, aren’t we meant to see God there too? If it is marred and disfigured by human greed and loses its place as a sacrament of God’s presence, does the beatitude about purifying the human heart also extend to renewing and purifying creation? This entry was posted in Religion and tagged beatitudes, eastern theologians, God, Gregory of Nyssa, Passionists, purity of heart on June 25, 2011 by vhoagland. I suppose we all try to visualize what famous people looked like. Many of them, like Paul the Apostle, left no portraits, but artists have imagined them for us. His fiery personality shines out in our first reading for today from his Letter to the Corinthians. The statue of Paul at the entrance to the old pilgrim church of St. Paul Outside the Walls in Rome is one of my favorites. 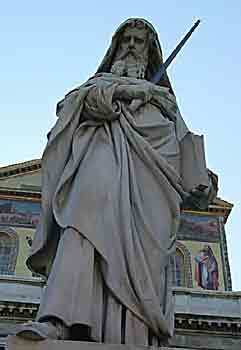 Paul’s portrayed as an old man, clothed in a heavy traveler’s cloak, bent and tired from coming a long way. He holds a great sword firmly in hand, but he’s not a military man. It’s the sword of faith he’s holding, a symbol of the faith that won hearts and banished darkness. He has “fought the good fight” and “kept the faith;” his earthly journey’s ended. Pictures on the church doors recall his final hours, when Paul died decapitated by an executioner’s sword not far from this spot, after a period of imprisonment in Rome. Did he review his own life then? I’m sure Paul wondered at the mystery of it all, especially the time a blinding light threw him from his horse on the way to Damascus, and then those hard journeys to towns and cities where he labored hard to bring faith in Jesus to so many. I don’t think he spent much time fighting old battles, though. Like those he had with the rival teachers who invaded his turf in Corinth. When it’s all said and done, it’s not our judgment that counts at the end. It’s God’s judgment that counts. Looking higher up on the façade of that great church that bears the apostle’s remains, we can see Paul the Apostle, pictured in the light of glory, his traveling days done. With Peter, a fellow disciple, he sits at the feet of Jesus Christ, the Risen Lord whom he loved so much. “Who are you, Lord?” Paul once cried, thrown to the ground. Now he knows, granted the grace, unmerited like all others, to see Jesus face to face. This entry was posted in Religion on June 17, 2011 by vhoagland. I’m preaching a retreat for priests next week and I’m wondering what to say. As usual, I ask myself –what is a retreat anyway? A car tune-up comes to mind. I usually delay getting it done because I wonder if I really need it; after all, the car still runs. Why go on retreat we say; we’re still going along spiritually? But the car needs to be tuned up; the oil needs to be changed; the tires need to be balanced and any unusual noises need to be checked out. The concept of balance stands out. A retreat is a time to regain spiritual balance. That’s suggested by a commentary on the Our Father by St. Cyprian I read recently. God is “our” Father; we pray for “our” daily bread; we ask that “our” sins be forgiven, the saint stresses. Early commentators like Cyprian emphasized a common approach to God as they reflected on the prayer taught by Jesus. It’s not just me and God. We go to God together, not alone, the saint says. My voice joins with others. I have to ask for others as well as myself. I have to pray that “Our bread–that is, Christ,” the cosmic Christ who embraces us all, be given to us all. We live in an age of “expressive individualism,’ as Charles Taylor describes it, and we need to rebalance ourselves by entering into communion with other realities besides ourselves. We’re imbalanced towards individualism, and imbalance is dangerous. What realities? Certainly we need to open ourselves to other human beings. We belong together and we need each other. We tend today to become preoccupied with ourselves, which leads to isolation and loneliness. We might need rebalancing. “As generous distributors of God’s grace, put your gifts at the service of one another.” ( 1Peter 4,9) It’s not enough for me to have gifts; it’s wrong to hoard gifts; I have to use them for the service of others. That will cover a multitude of sins, St. Peter writes, our personal sins. In an age of expressive individualism, it’s easy to fall into a selfishness that causes us to look out for ourselves and turn away from others. It’s not just the human world we must commune with. What about the natural world? The fragile world of nature so endangered today? Some say we have become imbalanced because we have lost our connection with the universe. We come from the dust of the earth; besides giving ourselves to our human family, we need to put our gifts as the service of our natural world as well. Finally, we must remember our union with God, our creator, the One who sustains us; the one who calls to intimacy and lasting communion. “God is my refuge and our strength,” we say in the psalms. “Without me you can do nothing, “ Jesus says. In the recent issue of the Jesuit magazine American (June 6-13,2011) Fr. Richard Hauser SJ reviews a book by Louis Savary call The New Spiritual Excercises: In the Spirit of Teilhard de Chardin, (Paulist Press) It’s an attempt to re-envision Ignatian retreats in the light of de Chardin’s evolutionary and cosmic perspectives. Good idea, the reviewer says. Is a retreat a time of rebalancing, renewing our communion with God, our human family and our world? Is a retreat a time to become aware of where we fit in the evolution of things, in the cosmic picture? I think so. This entry was posted in Religion and tagged Charles Taylor, evolution, individualism, Passionists, retreats, St. Cyprian on June 16, 2011 by vhoagland.